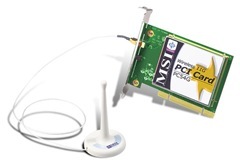 MSI's Wireless 11g PCI Card PC54G is a cost effective solution for desktop PC. It complies with IEEE 802.11g standard. WEP: 64 & 128-bit secured WEP (Wired Equivalent Privacy) encryption for securing wireless LAN data transmissions. SSID: Only stations using the same SSID (Service Set ID) are permitted to communicate with each other. Nearly five-time faster than IEEE 802.11b, the PC54G runs with data-intensive applications including real-time MPEG video streaming - ideal for home or office networking requirements. The PC54G is compatible with IEEE 802.11b standard, allowing full interoperability with any IEEE 802.11b certified wireless product.